It’s hard enough navigating through this world as a single child, and just when you feel like you’ve got a handle on things a sibling comes into your world and changes up the dynamic. I have heard from many moms with multiples how intense the fighting can be at times. On the other hand, there are beautiful moments where siblings just hug it out like crazy and play together like the best friends. 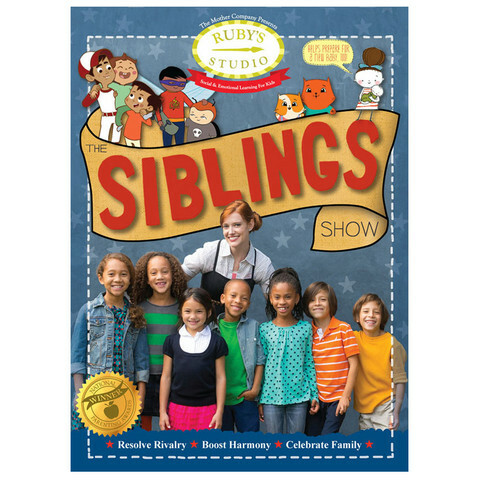 “The Siblings Show,” the latest installment in the “Ruby’s Studio” series, a multiple award winning show produced by The Mother Company, aims to encourage harmonious relationships between young siblings. Through animation and problem solving skits The Siblings Show offers relatable scenarios and tools to help siblings learn to understand and express their feelings, embrace teamwork and celebrate family. The show also addresses topics such as birth order, adoption, and anxiety around a new baby. Em has been very outspoken about not wanting a sibling for fear of losing time with us so being able to watch something that speaks to her and can comfort her is reassuring. In honor of National Siblings Day, The Mother Company released a video performed by Lucky Diaz and the Family Jam Band for the song “The Siblings Shake.” As expected, Lucky and Alisha pour their infectious, sunny personality into this song with a bit of whimsy and humor. It’s hard not to feel the love when watching these two! The Mother company is an awesome group of moms and experts who aim to provide rich entertainment to young children, and advice for parents. In addition to their latest installment, they also offer episodes empowering kids in areas of friendship, being the boss of their own body and safety. There is something for everyone in the family! Visit The Mother Company’s site and check it all out. You can learn more about “The Siblings Show” and purchase the full-length DVD here. « Can you KaraOkee? Sing along with the Okee Dokee Brothers!